In this project we’ll control LEDs using the Lilypad USB board. 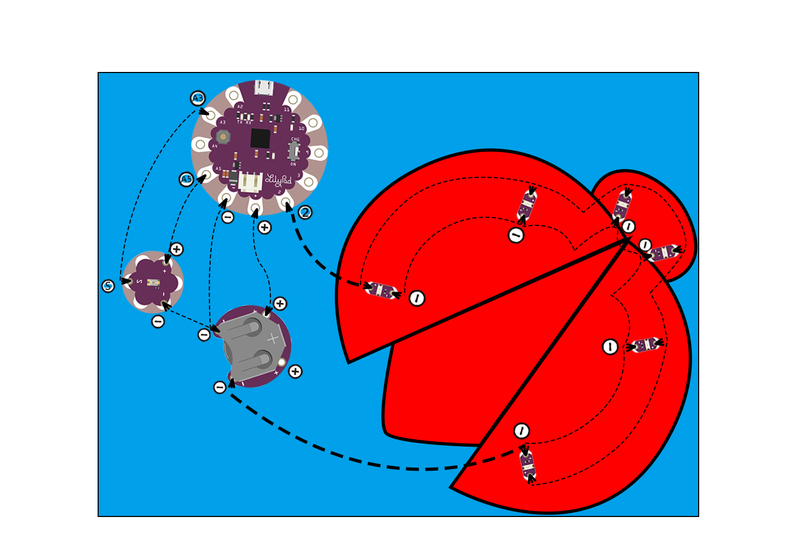 With upload the code into the Lilypad board, this projects can now have more advanced behaviors, and interactions are even reprogrammable. 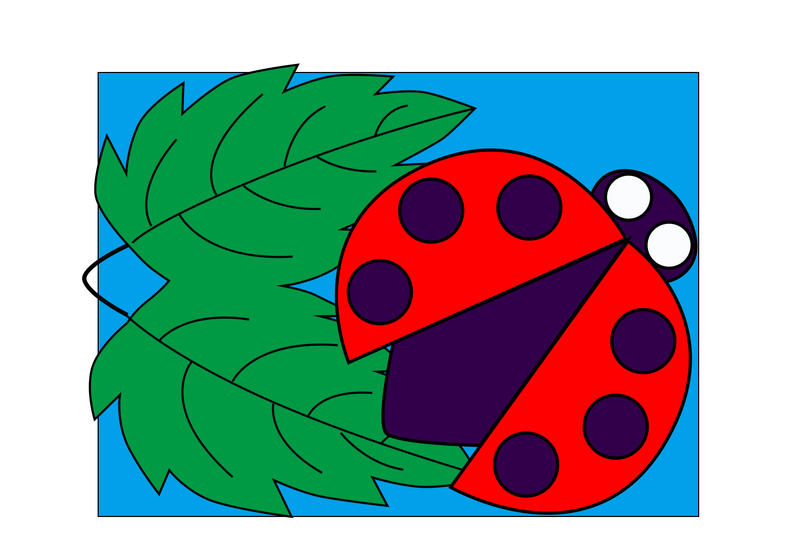 We’ll sew the LilyPad components on the colorful felts and customize the theme and decoration. Follow along with the circuit diagram on the template, or design your own layout and shape on a piece of paper. Trace onto the felt, and cut. 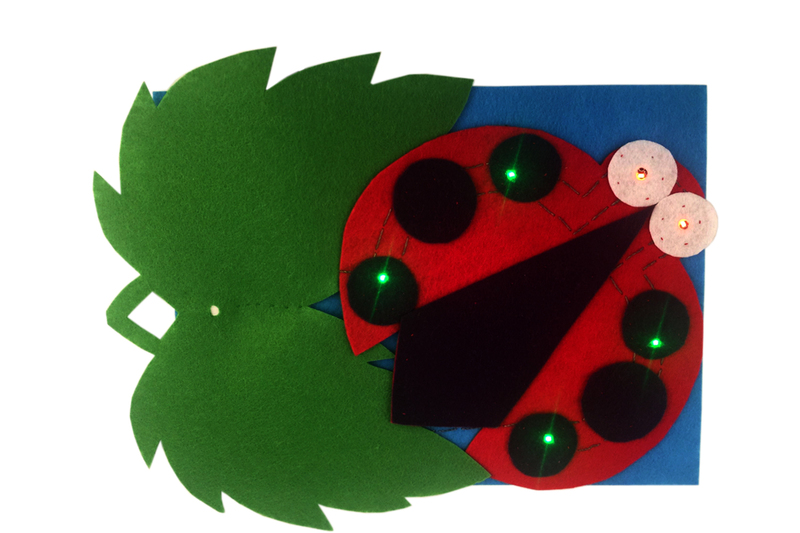 We’ll add the LilyPad USB board to a customized felt to hang on a wall or sew into a project. 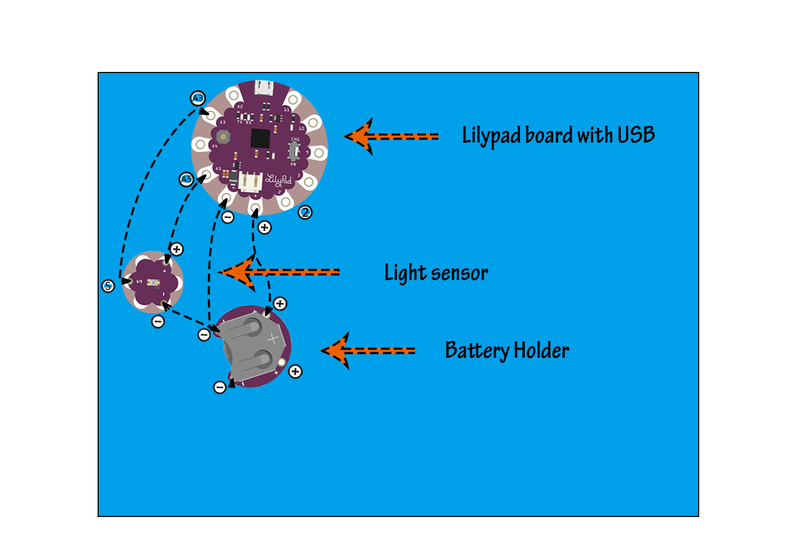 The LilyPad USB is a small computer that can store information and commands to control different sensors and boards connected to it. 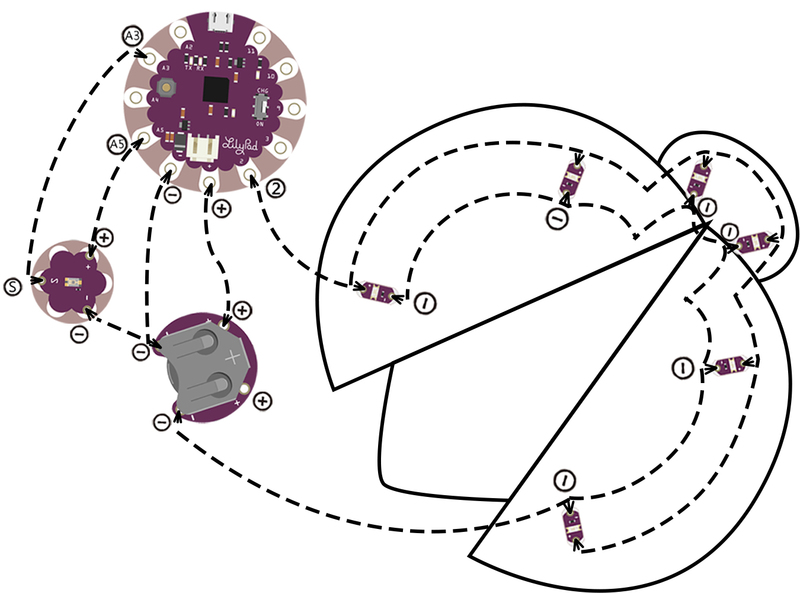 Programmable boards like the LilyPad USB Board are called microcontrollers.The Lilypad need to been programmed in advance with a set of behaviors called code. 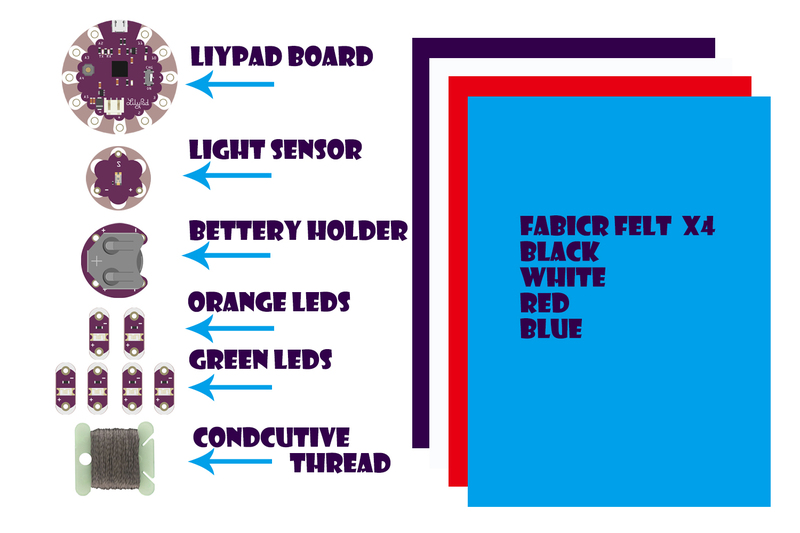 You will need seven LilyPad pieces: the LilyPad USB board, LilyPad Coin Cell Battery holder, six LEDs and a LilyPad Light Sensor. Arrange the pieces on the felt according to the diagram (or your own custom design). Carefully securing each piece with a dab of glue. Double check the orientation of the LilyPad pieces against the diagram or template before gluing. Cut a long piece of conductive thread, thread the needle, and tie a knot at the end. 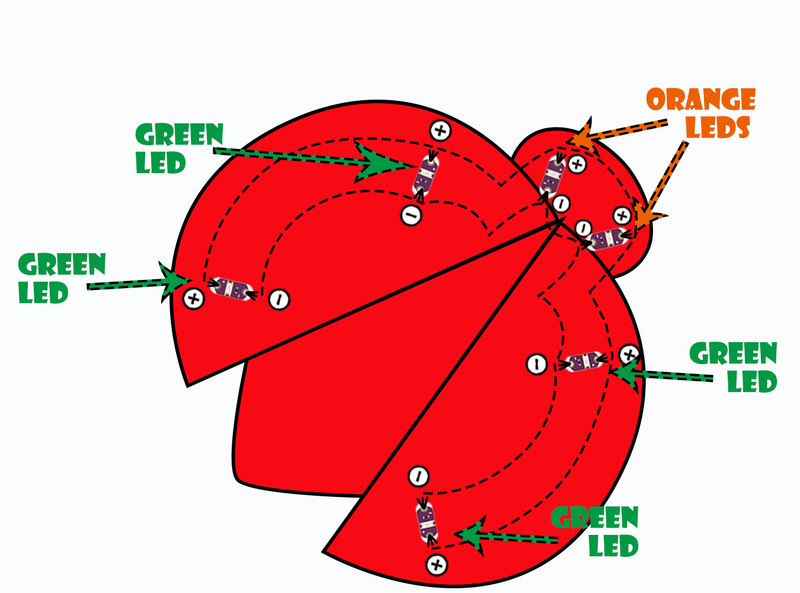 Sew your first connection: starting from the positive sew tab of one green led, connect each of the 6 LEDs with a running stitch and three loops of conductive thread around each positive (+) sew tab. Tie and cut your thread.Noted that the third and fourth LEDs are orange as ladybird eyes. With a new piece of thread, repeat the process for the negative side of the circuit – connecting the 6 LEDs’ negative sew tabs to one another and, finally, the negative sew tab on green led. Tie a finishing knot, and trim any excess thread. Then we’ll connect the LilyPad USB Board to the LilyPad Coin Cell Battery holder. Sewing three to four loops around Tab (-) of the LilyPad USB Board, and continue stitching from Tab (-) of the holder to Tab(-) of the light sensor . Tie and cut. With a new piece of thread, Sewing three to four loops around Tab (+) of the LilyPad USB Board, and then continue stitching to connect Tab (+) of the holder. Tie and cut. Last,with a new piece of thread, begin at the tab 2 of the lilypad USB board and stitch three to four loops around the sew tab. Continue stitching to the positive side of the last LED, ending with three to four loops. This will require a longer piece of thread than in other steps.Begin at the negative (-) sew tab on the battery holder, and continue stitching along the outside edge of the project, connecting the negative tab of the last LED on the other side. 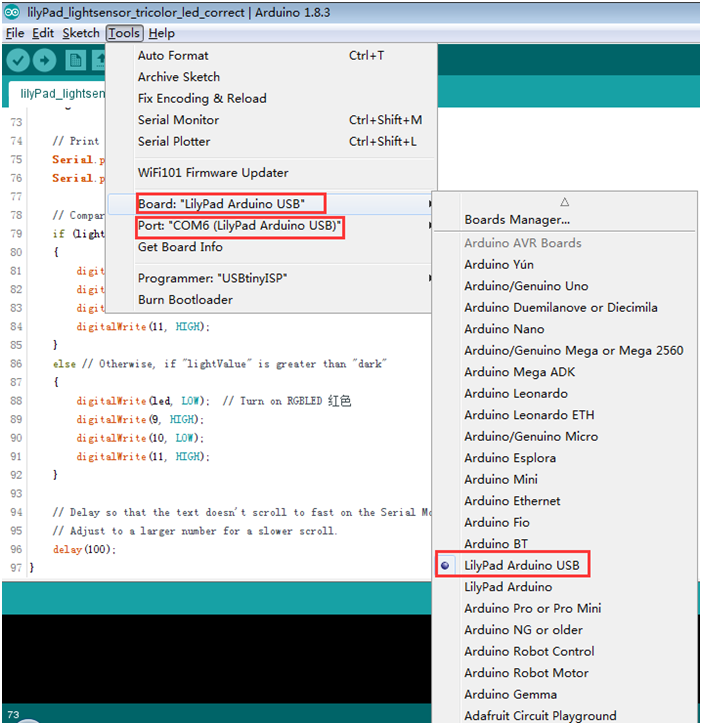 Before uploading the code into lilypad board ,you need to install the arduino IDE on your computer.You can grab the most recent version of the software from Arduino’s downloads page (https://www.arduino.cc/en/Main/Software). 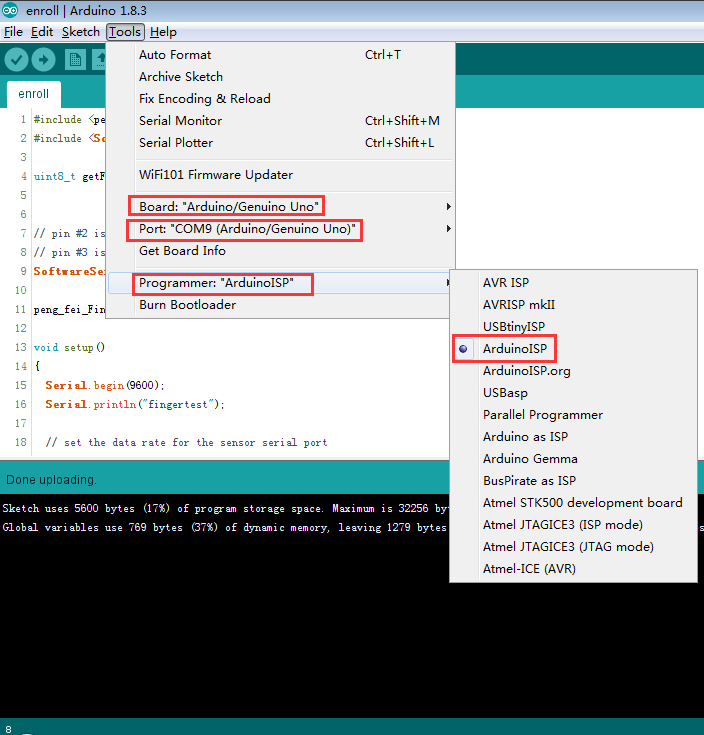 Check out our Arduino installation guide (Windows, Mac, or Linux) for help installing the IDE. Open it, and then uploading the code, by clicking the right-pointing-arrow-icon button. Give Arduino few seconds to compile the code, and then a few more to upload. Insert the coin cell battery into the LilyPad USB Board’s battery holder with the positive (+) side facing up. Cover the light sensor, all leds should light up.If so, remove the battery and continue to the Finishing Touches section. After checking the function of the circuit, it’s time to customize your design. Adding light-colored felt over the LEDs can hide the boards and diffuse the light. If covering the light sensor with a felt decoration, make sure to cut a hole above the sensor so it is not blocked/covered.